Rendering of the Capitol Crossing project looking south; image courtesy of Property Group Partners. The Museum’s Found Ground series was inspired by a major construction project in our own backyard. 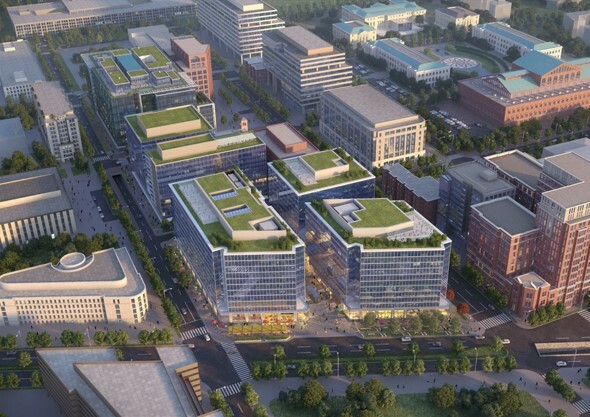 It’s hard to miss the Capitol Crossing project, which spans 3 city blocks and when complete will add 2.2 million square feet of office, residential and retail space to downtown Washington, D.C. However, it’s not only the size and proximity that catches attention, but the fact that the project is being built over a section of the I-395 center leg freeway, which will remain active after the project is complete. The project is one of several being built or planned over existing transportation infrastructure or within other marginal areas in cities across the country, including the Hudson Yards project, being built over the rail yards on the west side of New York City, and the Underline, which will transform the land below Miami’s Metro line into a 10-mile linear park. We developed the Found Ground series, so named for the concept of finding new life in existing acreage in the middle of a city, to discuss the stories behind these exciting projects. They were considered physically, logistically, and financially impossible only a few years ago, and they have the potential to radically transform the way we think about reclaiming urban spaces. Capitol Crossing: Local Perspectives on November 13. Reclaiming the Urban Spaces on December 11.